I had quite a few people say to me after yesterday's post, 'but what about me? I have brown eyes'. Well, today I'm going to... do another post you won't like. Soz. 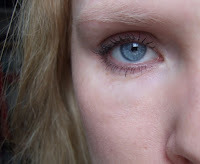 I'm dedicating a bit of time to my fair-haired, blue/green-eyed sisters. Hey girls, wear sunscreen! This morning I decided to test out my new favourite Prestige eyeliner to see if I could use it on my waterline without looking like I'd joined a girl gang (black liner gives me an 'edge', shall we say). I applied the liner on top and bottom inner rims, added some matt brown shadow in the crease and through my brows, lots of mascara and a smudge of Eight Hour Cream on my lids to give a bit of shine. Surprisingly this did not result in any creasing or patchiness by the evening. Now I never claimed to be amazing at makeup application so please be kind! 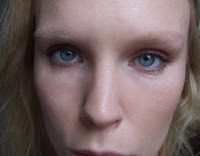 I just wanted to show how the black/brown pencil brings out the colour of blue or green eyes, and how you can create a relaxed look, which with a darker liner on fair skin would be very 'evening' and dramatic. Messy smudgy dirty eyeliner against pure angelic-looking pale skin and hair is a killer combination. Rowr. *Blushing* You guys! It was actually more pronounced in real life, the photos make it look really subtle.